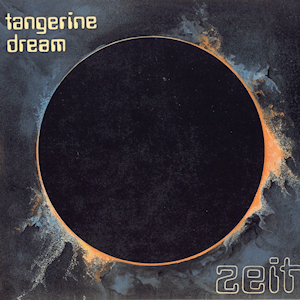 If Bryce Seligman DeWitt is correct and the Many-Worlds theory is proven correct then this Tangerine Dream album could possibly be the most important record in at least one of the millions of alternate realities that would exist alongside ours, imagine watching Edgar Froese as a judge on the X-factor. I used to think Atem was the hardest listen of the T-Dream canon, but after listening to this again I have got to say this is some strange album. I tried a little experiment with this album tonight and put it on in a darkened room, I lasted about 3 minutes then turned the light on. An aside; I once vomited after listening to this album, at the time I blamed a dodgy pie, I now think I should have blamed it on dodgy ambient, krautrock. Micro review; Music from another dimension, quite literally. Sounds even scarier in the dark. This entry was posted in Uncategorized and tagged Tangerine Dream. Bookmark the permalink.